I’m sure I’m not the only one running the ruler over capital goods giant GE (General Electric). Still influenced by the rein of Jack Welch from 1981-2001, the company is number 1 or 2 in an astounding array of businesses. Pretty good businesses at that. Overhyped in the latter Welch years and hungover under Jeff Immelt, the stock languishes where it was 20 years ago. New CEO John Flannery appears surprisingly intent on shaking things up considering he’s a GE lifer. He’s already ditched the corporate jets and company cars. He considers current cash flow ‘horrible’, that ‘everything is up for examination’ and there are ‘no sacred cows’ in the company’s portfolio. There’s a fella in Omaha who’s been reading GE quarterlies since before John Flannery was a kid. And I’m pretty sure he’ll be watching these changes closely. GE is a business Warren Buffett knows well. It has a lot of overlap with existing parts of Berkshire Hathaway. GE’s most important profit generator is the Aviation segment. This business is the world’s largest supplier of engines for commercial and business aircraft. It’s an industry with extremely long development lead times, massive capital outlays and immense safety oversight, creating significant barriers to entry. It takes hundreds of millions of dollars, and a decade or more, to bring a new jet through the design and testing phases and into commercial production. GE then sells those engines to airframe manufacturers (Boeing or Airbus) or airlines, generally at a large loss. By following up with decades of high-margin aftermarket parts and service, it recoups those loses and more. The barriers to entry push the industry towards a high degree of concentration. GE operates in a duopoly in wide bodied commercial aircraft (with Rolls Royce, which the Forager International Shares Fund owns) and currently has the leading market position in narrow bodied aircraft over Pratt & Whitney. Buffett knows the aerospace business well. Last year, Berkshire acquired Precision Castparts for a lazy US$37bn. Precision’s main business relates to aerospace, where it sells component parts used in both GE and Rolls Royce engines as well as airframe parts directly to Airbus and Boeing. Buffett has called Precision Castpart’s CEO Mark Donegan ‘a one of a kind’. Imagine what he could do at GE Aviation. Berkshire has other links to aerospace – subsidiary IMC Group/Iscar is the leading supplier of cutting and metalworking tools for the global aerospace industry. And Berkshire owns NetJets, a major buyer of business jets. GE’s second largest producer of profits is the Power division. GE is the global leader in power generation technologies, and claims that its equipment delivers one-third of the planet’s electricity. It makes power plants run by gas, coal and nuclear fuels. GE also has a rapidly growing Renewable Energy business offering onshore and offshore wind and hydropower products and services. Again, this is a business Buffett knows well. Berkshire Hathaway has been involved in the electricity generation, transmission and distribution businesses for several decades through its MidAmerican Energy subsidiary. And Berkshire’s Precision Castparts is a supplier of industrial gas turbines. Oil & Gas – equipment and services for the oil and gas industry. This division has grown significantly since GE got majority control of Baker Hughes earlier this year. Transportation – produces locomotives, among other things, and is a major supplier to Berkshire’s railroad business BNSF. Berkshire bought US$3bn of GE preferred stock in the depths of the financial crisis of 2008, emergency funding to allow the group to stay afloat. This preferred stock was redeemed by GE in 2011. Berkshire also held a very small position (by its standards) in GE ordinary shares for most of the past decade. Interestingly, it sold out in the second quarter of 2017. My bet is that happened just before the news emerged in June of Immelt’s ‘retirement’. The stock is down almost 30% since. Maybe the price isn’t right yet. But I wouldn’t be surprised to see GE back in the Berkshire stock portfolio, this time in more meaningful amounts. Buffett has a predilection for good business that previously lacked focus, buying them after their boards recognise and begin to rectify the problem. Appointment of new management is usually part of the process. As illustrated in the book The Outsiders, Buffett bought shares in GEICO in 1976 after a new CEO was appointed to focus on the insurance business. He bought a stake in Coca-Cola in 1988 a few years into Roberto Goizueta’s campaign to unwind the ‘diworsification’ of previous management. He brought into defence company General Dynamics after Bill Anders started to radically right-size the business after the Cold War ended. And he bought American Express shares for the second time in the mid-1990s, after it spun off Lehman Brothers. I could also imagine Buffett making a more aggressive move. Don’t be surprised if he tries to buy parts of the company. And a bid for the whole of GE wouldn’t be impossible. 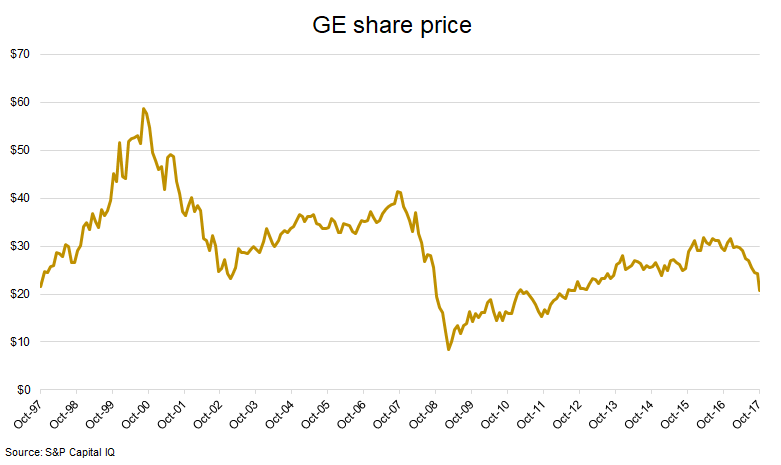 GE has an enterprise value of US$325bn. But it has quite a bit of debt already in place. The market capitalisation at today’s share price totals US$180bn, versus Berkshire Hathaway’s US$465bn. Hostile takeovers aren’t part of Buffett’s playbook, and I have no idea whether the GE board is receptive to friendly approaches. Even if they are, it would be a huge bite, far and away the largest acquisition in Berkshire’s history. But the company is sitting on about US$100bn surplus cash, with a few billion more rolling in every month. To use his own metaphor, Buffett is elephant hunting and carrying a very big gun. Aged 87, he doesn’t have decades left to put that immense hunting experience to work.